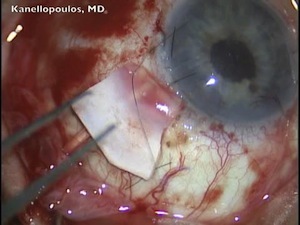 Gabor Scharioth, MD, performs a routine canaloplasty to manage intraocular pressure. He inserts a flexible micro-catheter 360 degrees around Schlemm's canal. The illuminated tip indicates the catheters position. As the catheter is removed a suture is pulled through the canal and tied. Currently there are two canaloplasty devices available: iTrack from iScience and GlaucoLight from Dorc. Very nice surgery, thank you doctor.